I came across this recipe on Nicole’s wonderful blog- Pinch My Salt and decided that this was something that had to be tried out immediately. It looked so very appealing. And for once I had all the required ingredients at home! I made a couple of changes to the original recipe. I cut down on the amount of butter used, increased the amount of yogurt, substituted the granulated sugar with equal amounts of brown and regular sugar and also threw some raisins into the batter. The results were pretty impressive, if I may say so myself. The batter turned out to be enough for almost 2 loaves so that’s what I ended up doing- baking 2 loaves. They turned out really well. They were moist, sweet, soft and spongy- just the way I like it. In a large bowl, cream the butter and sugar. Add eggs, beat well. Add the yogurt, orange juice and orange extract. Mix well. Mix the dry ingredients well and combine with the wet ingredients. 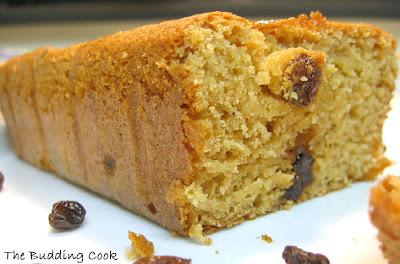 Add the raisins and mix into the batter. Pour into greased loaf pans. Cool the loaves. Poke a couple of holes on the surface of the bread. Drizzle the glaze and spread all over. This is a really good bread/cake to have along with a hot cup of tea or even as an after-dinner treat when you are craving something sweet. We simply loved it and I am definitely going to make this again and again. Nicole, thanks a ton for the recipe! looks so soft, good one tbc! Hey that looks so moist and delicious TBC and so easy too. Really, a perfect loaf to go with evening chai! I can certainly understand why it didn't take you long to try this bread. Now I want to try it too. Delicious! Yum. Very interesting recipe. I love baking with yogurt, it adds such a creamy texture to the final product. Thanks for sharing! ooo'my..that bread looks..ummm..drooling now. I have tagged you for a MEME. Take it at your ease. oh wow, the bread looks really fluffy and soft! Love the orange and yogurt combo! You have every right to "say so myself" - it looks lovely - I just had an orange for breakfast so I can taste this somewhat, know what I mean? The cake looks delicious!!!! Wonderful recipe. Hey girl, I too made some orange cup cakes. Have to post them. Hi, bread looks so good, yummmm !!! What a delicious-looking bread, tbc, and the addition of orange must give it a real flavor kick. I love the idea. Can't wait to attempt a vegan version soon. TBC, i know what you mean when you say that no matter how much you cook, the besan feels raw.You dont need to roast the besan separately. However, the secret to cooking it completely is to use a lot of oil in the first place and secondly keep a steel plate with some water and a weight on it and let the vegetable-besan mixture cook for 5-10 minutes. Remove, stir(if it sticks to the bottom, its ok, let it turn kind of brown and crispy) and again repeat the same process for 2 more times. That should cook the besan well. Hope this helps. Wow. That looks just superb. Looks really tempting and moist! mmm. the bread looks so mouth-watering. I wish I can bake like that. I love the idea of yoghurt in a cake. Nice one! I've never tried baking with yogurt before, though I have used buttermilk. I was very happy witht the way things turned out. Ramya- welcome to my blog. 2nd tip. It's for steaming the mix, right? I just cannot bring myself to use more than 1-2(max) Tbsp oil during cooking. I guess it is alright to do it once in a while though. Kalai- thanks, if you do, do let me know how it turns out for you. This looks super, duper moist! Gosh, I have yet to have this much moistness in my breads! I want two thick slices, please!!! Wow I see in a earlier post strawbeeries and now this ornage bread. Yumm you are in a wonderful cooking mood . Looks amazing! and the recipe too looks easy enough to try. Great share. Aaah.... Were you feasting on this while I was dieting? Too bad. Anyway I'm going to try this for sure atleast for my family. Looks darn good. The orange bread slice looks divine and tempting.The pictures are great. Nice Blog.